How far would you go to be forgiven? As far as remote, rural Alaska in winter? Ed left the tiny (fictional) town of Bethlehem, Alaska, five years ago, on the heels of a family tragedy. Now he’s back, hoping to reconcile with his angry, bitter, estranged brother. A gay Jesuit priest, Ed has just left his order. He’s questioning his relationship to God and the universe; he feels that he’ll find redemption under the cold, starry skies. To his surprise, given his tenuous future, he also finds love — with a recently arrived nurse who’s feeling a little lost himself. Ed’s sister-in-law Maggie called him back. But his brother, Roger, wants no part of him, blaming him for the family catastrophe. A broken man who drinks too much and alienates his long-suffering wife, Roger reaches out in the wilderness by broadcasting a daily radio show — to almost no one — from his “shack” (excellently designed, with many authentic arctic details, by Kristen Flores). Ed is struggling to reconcile his faith with his homosexuality, his grief with his mortality. He wants to reclaim his sense of self. Against a backdrop of this vast, snowy expanse, there is considerable isolation, but there’s also the forced intimacy of a small town, where community is a necessity and privacy a rare commodity. Compassion is hard to come by at home. But Ed finds his own “family” in his new lover, Joseph, and an eccentric older Filipina, Irma. Joseph is adrift and Irma has suffered loss, but the three of them come together, united by their staunch Catholicism and their bond of love and promise to take care of each other. Up-and-coming young playwright Miranda Rose Hall calls her new play, which is having its world premiere at Diversionary Theatre, “The Hour of Great Mercy,” referring to the holy time during which Jesus died, when it’s said that anyone can pray for compassion in their own agony. All of this may sound deep and dark, heavy and ponderous. While Hall is dealing with complex and profound existential questions, her play is laced with laugh-out-loud playfulness. For the audience, the emotional ride can be neck-snapping, flipping from serious to humorous in a nanosecond. But this makes the play uniquely imaginative and compelling. What Hall’s getting at here is our humanity, our capacity for coming together for understanding and compassion. She couldn’t ask for a better production than the one she’s getting at Diversionary. 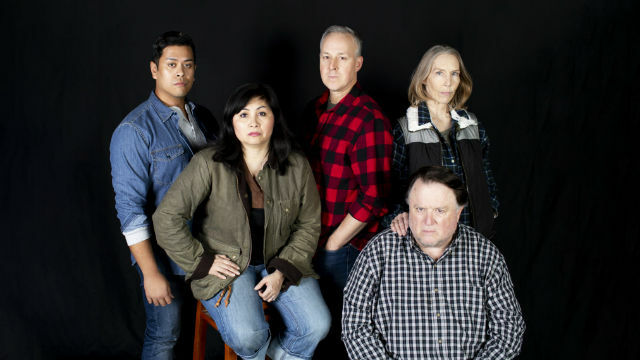 Director Rosina Reynolds brings sensitivity and a strong sense of place to this multi-layered play, and she’s marshaled a wonderful, intensely committed cast, each of whom creates a credible, flawed and troubled character. Ed and Roger take the most extreme journeys. One has to decline, and the other has to rise, from the depths of his own despair to a place of forgiveness. As the tortured Ed, Andrew Oswald is riveting throughout. And he displays a magnificent piece of acting when he shows the physical and verbal degeneration of a progressive debilitating disease. Tom Stephenson makes gruff, coarse, hardened Roger a sympathetic character by the end, as he realizes he’s lost everything, and has one last chance to listen, and try to understand. As Roger’s wife, Maggie, Dana Case is, as always (she’s onstage far too rarely), frank and unaffected. Her Maggie is conflicted, both tough-as nails and making an honest effort to get the brothers to reconcile. Patrick Mayuyu’s Joseph is a kind of angel: a gentle, caring, altruistic soul who’s capable of giving unconditional love. And New York-based Eileen Rivera is hilarious as Irma, the good-hearted busybody who has wisdom and advice for everyone. The technical elements combine to re-create this icy desolation. The lighting design (Curtis Mueller) conveys the dimness of a place with only five hours of weak daylight, and also offers a dramatic reflection of the Northern Lights. The sound (Emily Jankowski) channels the howls of the wind and wildlife. The costumes (Elisa Benzoni), all flannel, plaid and parkas, give us a chilling sense of that 20-below environment. The writing is genuine, funny, poetic, musical and lyrical. And the themes, despite the barrenness of the locale, are spiritual and universal. Performances are Thursday at 7 p.m,. Friday-Saturday at 8 p.m., Sunday at 2 p.m.